Of course, there have been specific recipes in Dorie Greenspan’s book Around My French Table that have become favorites. Lazy People’s Chicken is at the top of that list. However, more than the recipes, it’s the techniques and “formulas” that I’ve learned and added to my repertoire that make this book such a treasure. This week’s recipe for French Fridays with Dorie was one of these non-recipe formulas. 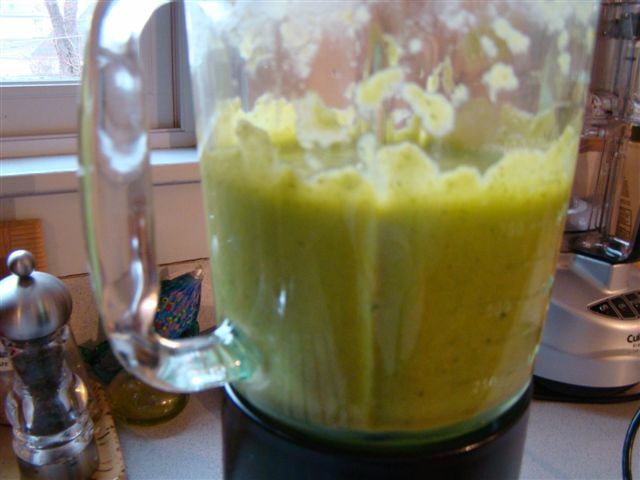 Christine’s Simple Party Soups was this week’s challenge. 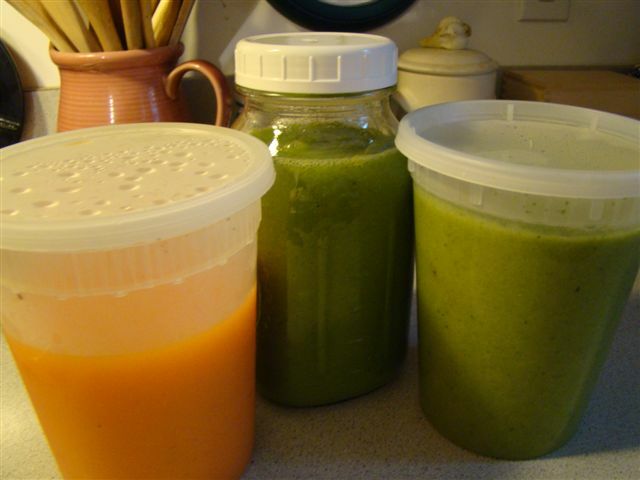 Dorie offers a trio of soups: red pepper, asparagus, and broccoli. The recipes were as simple as you can imagine. Basically, the ingredient list includes just two things: the featured vegetable and some stock. Hmmpf! How could that be tasty? Most soups I make, and I make a lot of soups, start with sautéed onions in butter and oil and maybe some carrots, celery, and garlic before adding the main vegetable. For this soup, there’s none of that. 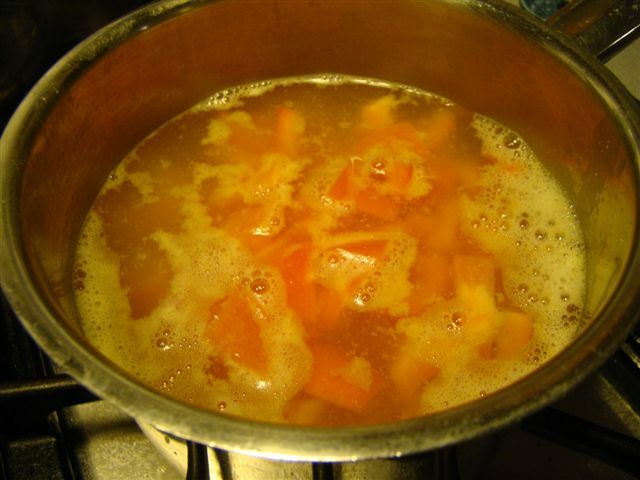 You add chopped vegetables to boiling stock and simmer until the vegetables are cooked, then puree in the blender. That’s it. That’s all. The end result should be called Essence of Vegetable Soup. The flavor of the featured vegetable comes through loud and clear. And, it’s January, so vegetables aren’t even at their peak. (I used frozen asparagus, fresh red peppers and broccoli). To top the soups, Dorie offers instructions for spiced whipped cream. I’m not a huge fan of whipped cream, so, instead, I used dollops of Greek yogurt and a sprinkle of the recommended spice, a different one for each soup. That would be red pepper flakes (I used Aleppo) for the red pepper soup, cardamom for the asparagus, and curry powder for the curry. I loved the light touch of spice with each soup. I’m wondering how it would be to add the spice to the soup as it simmers, but I’m worried that the pure vegetable essence that I also loved would be lost. Each soup was distinct and delicious. Though I reduced the liquid by two-thirds because I like my soup thicker than Dorie does, the red pepper was still very thin compared with the others. My favorite is either the asparagus or the broccoli. It’s hard to choose. Howard was away most of the week, but liked the red pepper soup as a starter for last night’s dinner. He brought asparagus soup for lunch today, but I haven’t gotten a report yet. My mind is running through the roster of other vegetables that could be used. I’m hoping this will be equally successful with winter’s root vegetables, like carrots, squash, or rutabaga. I’ll be giving it a try. The recipe can be found in Dorie Greenspan’s book Around My French Table. 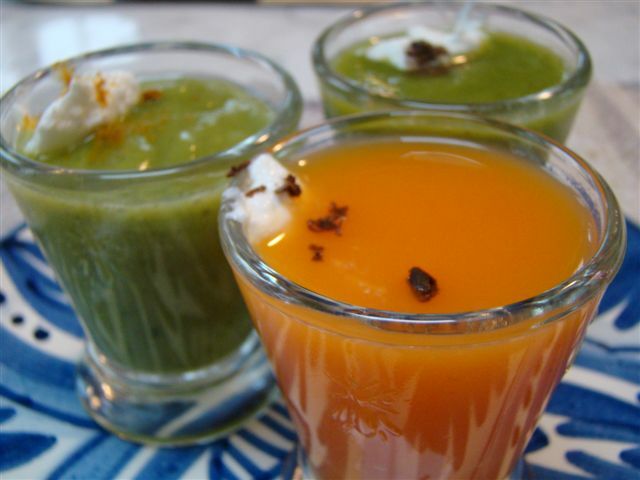 To see how my French Friday friends made out with their simple soups, follow their links here.